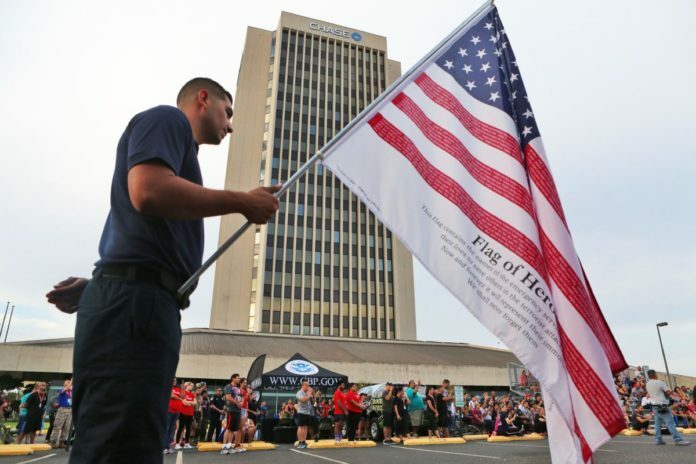 David Aragruz of the McAllen Fire Department carries the Flag of Heroes as participants take part in the annual McAllen Stair Climb at the Neuhaus Tower on Sunday, Sept.9, 2018, in McAllen. They climbed 110 stories, the height that was the World Trade Center Towers, to remember the 343 firefighters that died on September 11, 2001, as they attempted rescue of those trapped in the two towers in New York City. McALLEN — “When you’re tired and you can’t take one more step, look down at that lanyard, look at that picture and remember why it is that we’re climbing,” were the words of motivation 343 people, some dressed in athletic clothes, others in bunker gear, received before ascending 110 flights of stairs to mark the 17th anniversary of 9/11. Sunday’s fifth annual McAllen Stair Climb was one of dozens of events held across the country to pay tribute to the 343 firefighters who died responding to the World Trade Center during the Sept. 11, 2001 terrorist attacks. When 24-year-old Alexandra Gonzalez, a firefighter with the San Diego Volunteer Fire Department, got tired of climbing with the nearly 70 pound pants, jacket, boots, air pack and helmet weighing her down, she looked at the image of 37-year-old Kevin Bracken. The eight-year veteran of the New York City Fire Department died responding to the South Tower, and like Gonzalez, his father had been a volunteer firefighter. Firefighters closer to home — like those from the McAllen, Pharr, Edinburg, Alton, Rio Grande City and Brownsville departments — as well as EMTs, police, Border Patrol employees and members of the public, all took part in the event, climbing the 17-story Neuhaus Tower on South 10th Street six and half a times, or a total of 110 stories, the number of floors in the World Trade Center buildings. Each participant wore a tag with the name and photograph of one of the fallen firefighters whose memory they honored. The tags, explained McAllen Stair Climb Director Mark Zamora, a 10-year veteran of the McAllen Fire Department, resemble the personal accountability system tags firefighters carry with them to a scene, wearing one and giving the other to their incident commander as a way of tracking their whereabouts. After they completed the 110 flights of stairs, each participant pinned their tag to a board, putting in perspective the number of firefighters that lost their life 17 years ago. “Can you imagine giving your life for the person down the street who doesn’t even acknowledge you, (and doing so) without even thinking,” said Amanda Knise, 37, of Raymondville of the sacrifice made by first responders across the nation. Knise, who first participated in last year’s climb, was a freshman in college in San Antonio on 9/11 and still remembers hearing the news about the terrorist attacks that killed nearly 3,000 people in New York, Washington, D.C. and Pennsylvania. Zamora, the event’s director, was a senior in high school Sept. 11, 2001 and said one of his motivations in organizing the event is to keep the memory of those who lost their lives alive for younger generations.